In a flashback, Yang trains Ruby in hand-to-hand combat. Yang will leave for Beacon Academy soon and wants to make sure that Ruby can take care of herself. After a short exchange of blows, Ruby uses her Semblance to seemingly dodge what would have been a certain hit, disappearing into the bushes of the surrounding forest. A sudden silence follows, and instead of Ruby, a large Ursa Grimm emerges from the trees. Yang takes on the beast, which knocks her away after a short fight. Nearby, Ruby, who was knocked down, gets back up and notices the Grimm, which now attacks her. 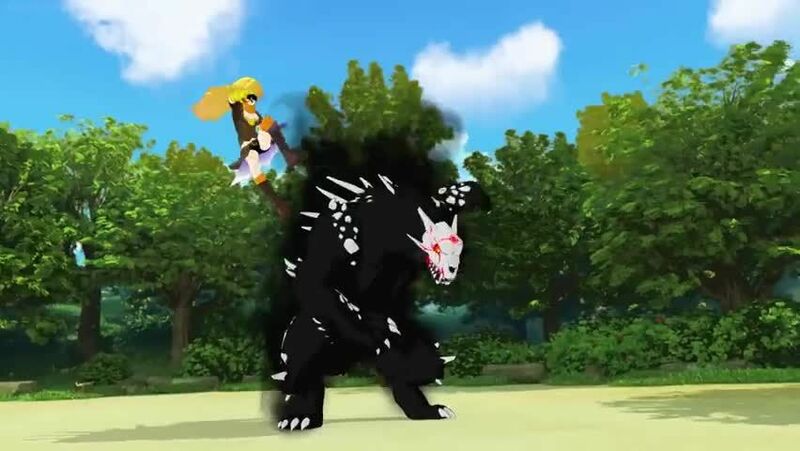 Yang comes back into the fight from out of nowhere, and her Aura is heavily damaged when the Grimm catches her in it’s fangs while she tries to shield Ruby. However, Yang is able to strike back and kill the monster. Ruby rushes to her big sister’s side and apologizes for not being able to help without her scythe. Yang tells her that it’s okay and that she always has Ruby’s back. In the present day, Yang rides her motorcycle through Anima. She continues her journey with a determined look on her face.